McIlroy wins 2014 Open Championship wire to wire. When Rory McIlroy turns on the light switch, it is not only on, it is bright. McIlroy is a major champion again winning the 2014 Open Championship. Only a win at the Masters remains for him to be a career grand slam winner. Moreover he is listed behind Jack Nicklaus and Tiger Woods as the youngest to win three legs of the career Grand Slam. Let’s get into it. At the par-4 first hole, McIlroy drained a birdie putt from 20 feet. I wondered how the day would end after he hit his second shot 40 yards offline on the par-5 fifth hole causing him to drop in a bad area leading to a bogey. At the par-3 sixth hole, he bogeyed a makeable par putt resulting in back-to-back bogeys for the 25-year-old. At the par-3 ninth hole, his tee shot landed right on the dance floor behind the hole. He would drain it to go back up four shots. Sergio Garcia gave chase. At the par-5 10th hole, he made an eagle and was in the mix at 14 under through 10 with McIlroy 16 under though nine. Garcia’s second shot on the par-3 15th was from the bunker and his third shot was also from there. Garcia’s chances to win would end there as he finished 15 under for a final round 66, tied with Rickie Fowler who was 15 under with a final round 67. “When he is on we know how good he can be. Very impressive, he deserves it,” Garcia said. Fowler played his best hoping McIlroy would commit errors. At the par-3 15th hole, Fowler nailed a birdie putt to give the man in the Nike gear a scare. It was not enough as Fowler ended up with his third straight top-five finish in a major championship and second consecutive runner up finish in a major. “He was impressive today, I needed a low one to catch him. He played very solid, I got out of gas too late,” Fowler stated. Back to the lecture at hand. Rory was calm all week. On the par-5 16th hole, he used driver off the tee, an 8-iron to get on the green, and put the competition to bed with an easy two putt for birdie on the 577-yard hole. He finished at -17 with a final round 71. “It’s pretty hard to describe right now to be honest. I’ve won my third major championship, it’s three legs out of the fourth for career grand slams, I’m feeling pretty good,” McIlroy stated. He will rise to No. 2 in the Official World Golf Ranking and becomes the seventh wire-to-wire champion in Open Championship history. Here is your Tiger Woods sighting. There goes your Woods sighting. He finished his final round at +6/75 as McIlroy was still on the practice range. Woods finished 69th — his worst finish over 72 holes in any major and wound up 23 shots behind, his largest deficit ever in a major. The name above Rory’s on the Claret Jug, Phil Mickelson, finished tied for 23rd at -5/68 with Justin Rose -5/72. 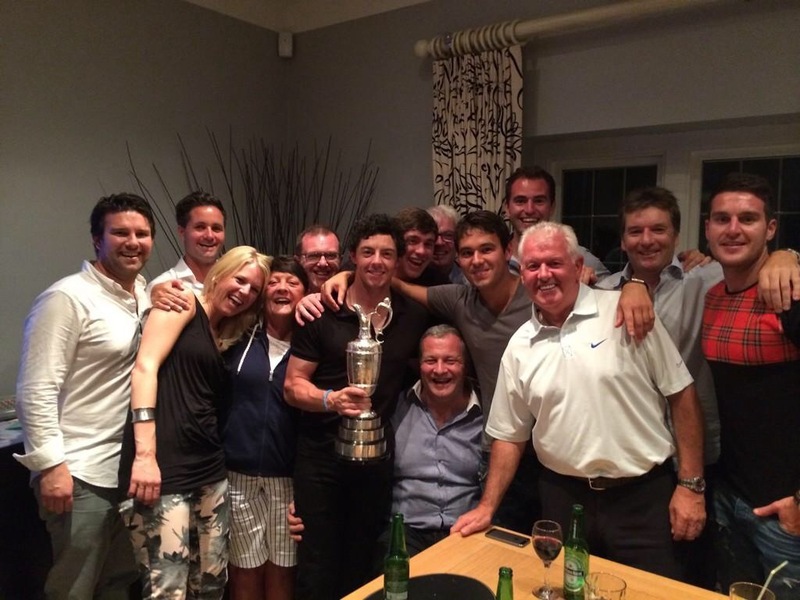 McIlroy’s mother was in attendance and they embraced for an emotional hug on the 18th hole. Mom was proud of her son. Dad was extremely proud since he saw this day coming. A spokesperson for British betting firm Ladbrokes confirmed on Sunday afternoon that it had held three bets that will allow McIlroy’s father Gerry and his friends to make more than $300,000 off his son’s victory at Hoylake. One bet believed to be made by McIlroy’s father was a 200-pound wager ($341) at 500/1 odds placed in 2004 for his son to win within 10 years. That bet will pay out $171,000. McIlroy won 1.6 million for this major win.